Product prices and availability are accurate as of 2019-04-17 20:04:22 EDT and are subject to change. Any price and availability information displayed on http://www.amazon.com/ at the time of purchase will apply to the purchase of this product. You spent time and money selecting the perfect grill, now make sure it stays good-as-new with the Napoleon TQ285/PRO285 Grill Cover. Whether on a frame, in the garage, or in transit, damage can still occur from moisture or mishandling and this cover helps prevent such a problem. Made from heavy-duty PVC polyester, the cover comes with a 3-inch ventilation strip to prevent moisture build-up and is UV-treated to stop sun-damage. An elastic closure snugs the cover tight over the frame for complete protection. This item includes a manufacturer's limited 1-year warranty. Dimensions: 23.5L x 8W in.. Woven from PVC polyester. Cool, modern gray color. 3-in. ventilation strip. Hanging loop storage. 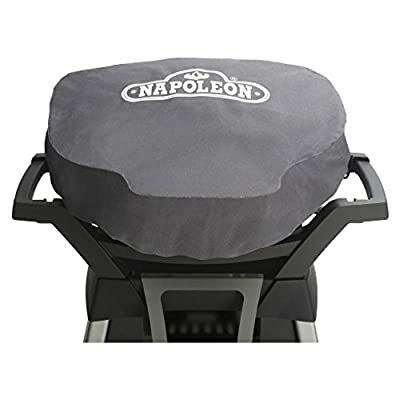 Fits portable Napoleon grills (TQ285 or PRO285). Manufacturer's limited 1-year warranty.